AppsFlyer's Audiences tool is designed to enable advertisers to easily segment and create groups of mobile users, organic and non-organic, directly from within the AppsFlyer platform. Audiences can be shared with integrated partners (or uploaded to a 3rd party such as Amazon S3 or Slack), primarily for the purpose of running personalized retargeting campaigns and to power lookalike targeting campaigns and exclusion lists. AppsFlyer’s Audiences tool allows you to build complex user segments across multiple time ranges, event values, and dimensions while getting accurate size estimations almost instantly. Every day, your configured Audiences are updated with the latest user data and uploaded to your selected partners. This allows you to create an Audience only once while having its data constantly updated to fit the previously chosen filters. Click Add Audience from the Audiences window. Set a unique Audience Name. Select whether this audience is an Android or iOS-based audience. Select New Ruleset, Select from my Audiences, or Import Audience. Select an app for the new ruleset user base. The dropdown box contains either the Android or iOS apps in your AppsFlyer account, depending on your earlier selection. Set the first filter (mandatory) according to users, who engaged with your ad, installed or launched the app. Click to add a secondary filter (optional). If a filtered event contains attributes, click Add Event Attribute. You can add multiple attributes filters for the same event. Connect other rulesets (optional) - You can use multiple rulesets, new or previously defined, to define your audiences. The rulesets can be connected with OR, AND or EXCLUDE logical connections. The event values and attributes are extracted from your existing AppsFlyer data, so you can choose custom events as well as native AppsFlyer events. Did Event and Did Not Do Event allows you to select an in-app event and criteria of "at least", "exactly" or "at most" number of in the last X days (e.g., performed af_purchase at least 3 times in the last 30 days). Event Attributes allows you to select in-app event values conditions Is, Greater Than or Lower Than. Total Revenue is the sum of all purchases per device, which are reported to AppsFlyer under af_revenue (revenue generating events). Total Revenue is calculated based on the Audience’s selected date range (1-120 days back). Country criteria options are Is or Is Not applied to countries from a predefined list. Metros are regions larger than cities, that may cross state lines. App version and OS version options are Is or Is Not applied to the values from the list of app data. Using your own event attributes can create amazing laser-sharp audiences for your campaigns. This ruleset above defines an audience of users that have made at least 1 purchase of 1 item, that cost over $10, in the last 120 days. You can save time by creating new audiences by connecting existing audiences or combining existing audiences with new rulesets. AppsFlyer provides you with a robust dataset that you can use to create versatile audiences. Yet, as an advertiser, your BI systems gather and manage large datasets that can also be used to create audiences. Use the data in your BI systems to segment users into lists of device advertising IDs. 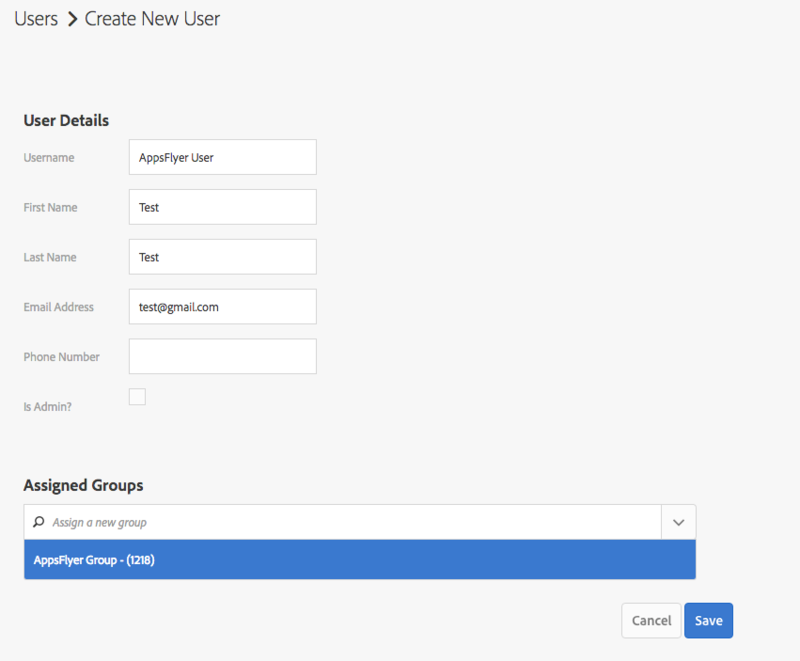 Then import this list to AppsFlyer to create an audience. You want to target users who have their birthday this month with promotional offers. Your app development studio acquires another studio. This studio has a list of users that installed their apps and you want these users to install your apps. Add - Add additional device advertising IDs to an existing audience. Choosing an API Action only changes the path in the URL endpoint that you copy in step 3. It doesn't persist after you save the audience. When you want to add or remove devices from an audience, you can specify the action in the audience endpoint URL as /add or /remove. The next step is to send a POST request to the API endpoint with a body that contains the device IDs. Each imported audience that you create has its own import key. The import key identifies a specific audience for adding or removing device IDs from the audience. When you make the request, make sure that the import key belongs to the audience that you want to add devices to or remove devices from. When you make the request, make sure that the platform (Android or iOS) is the same as the platform that you choose when you create the audience. The request body contains an empty list of devices. You must provide at least 1 device ID per request. See the request sample above. Users are likely to belong to more than a single audience ruleset. When you define more than one ruleset the Overlap widget appears, which shows the different audience groups created by your rulesets, and how they relate among themselves. Use the Overlap widget to engage your clients with the most suitable marketing message. Choose the best ads to show to users, who belong to more than one audience ruleset. 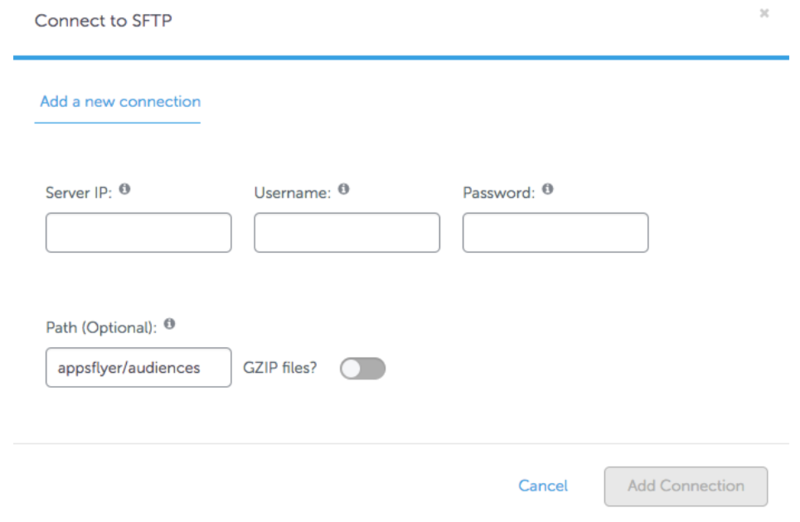 To upload audiences to integrated partners automatically, you have to establish a connection with each partner only once. Then the audience's device list gets updated daily. For details of how to configure each partners, click here. Follow the specific instructions (Log in / Enter credentials) for each of the partners in the promoted configuration screen. Click Close to exit the Audience builder. Once saved, AppsFlyer automatically uploads your Audiences to their designated partner once a day. With some partners, AppsFlyer uploads only the new generated devices and deletes the expired devices on the partner's side automatically. 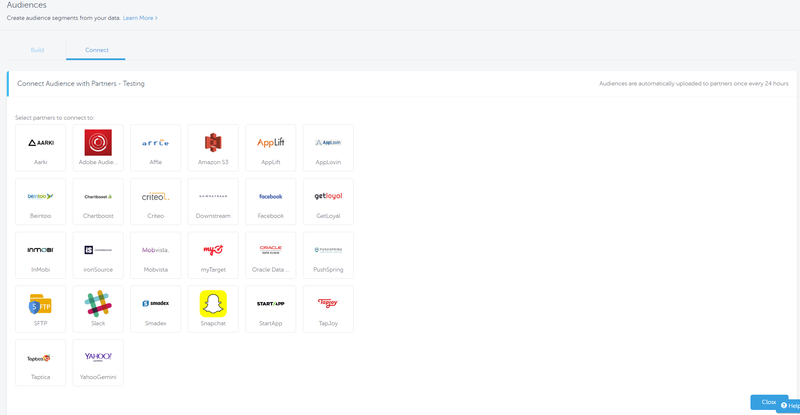 With the rest of the partners, AppsFlyer uploads the full list. Either way, the relevant partners are fully updated once the audience lists are generated. If you don't select any network, the audience is not uploaded anywhere, but it is still updated on a daily basis. You can download it in the CSV format. The Split Audience feature enables advertisers to run A/B tests on an audience across different partners. Once Split Audience is enabled in the Connect to Partners tab of the dashboard, it uploads a relative and unique chunk of the audience's data to each of the connected partners. Click Close to save the configuration. Once saved, AppsFlyer uploads your split audience to its designated partners once a day. Split Audiences are represented in the main Audiences page. The Split Audience icon appears to the left of the Audience Partner icons under the Upload To column. Changes such as adding, removing or replacing a partner to an existing Split Audience configuration may alter the results. This is due to changes in existing audience populations. Obtain your app's API Key from your Aarki account manager. Paste your API Key in the input bar. Past your API Key in the input bar. AppsFlyer creates and syncs Traits with your selected DataSource. On the Data Sources page, create a new Data Source. 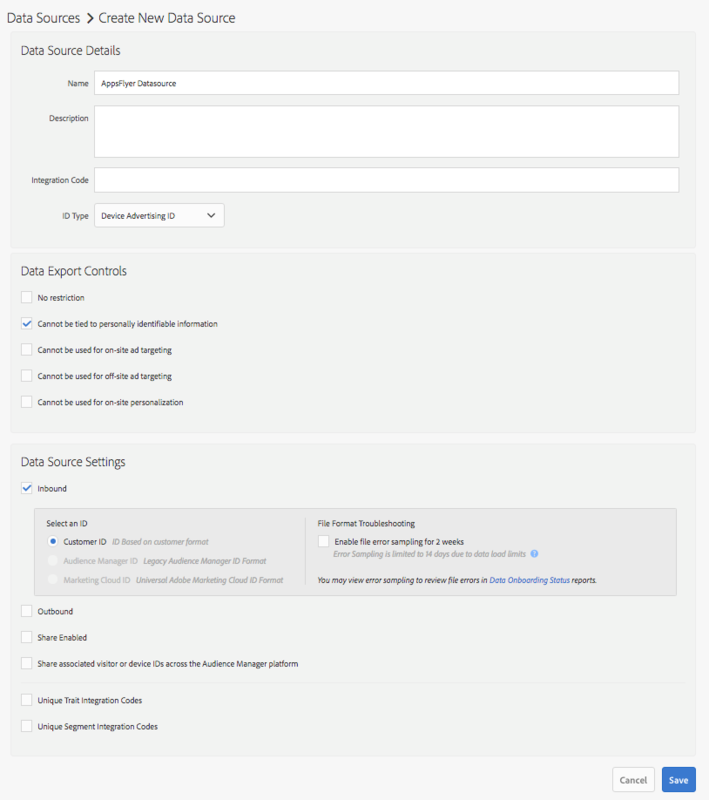 Set the ID Type to Device Advertising ID, and the Inbound settings to Customer ID. Once saved, you are redirected to the Data Sources selection menu. Find your newly created Data Source, and save its ID for later. In the left-hand menu, select Administration >> Groups. Save the group and go to Administration >> Users. Select the group you previously created in the Assigned Groups selection menu. Copy the Data Source ID, and the Email and Password of the user you previously created. 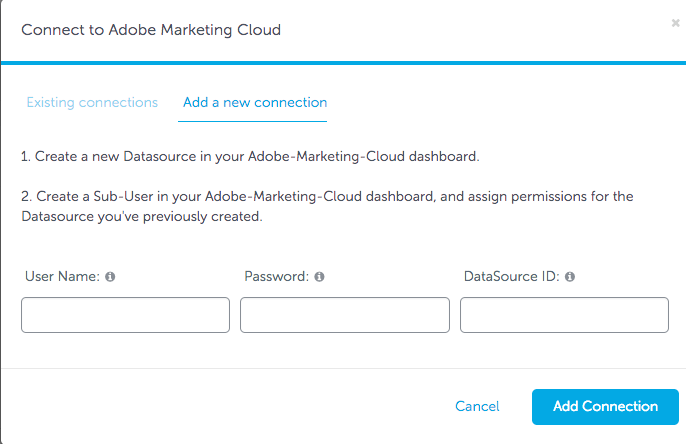 About 24 hours after uploading your audience to Adobe, you can see the data in your Adobe Marketing Cloud dashboard, under Analytics >> Onboarding Status. Obtain your app’s API Key from your Affle account manager. 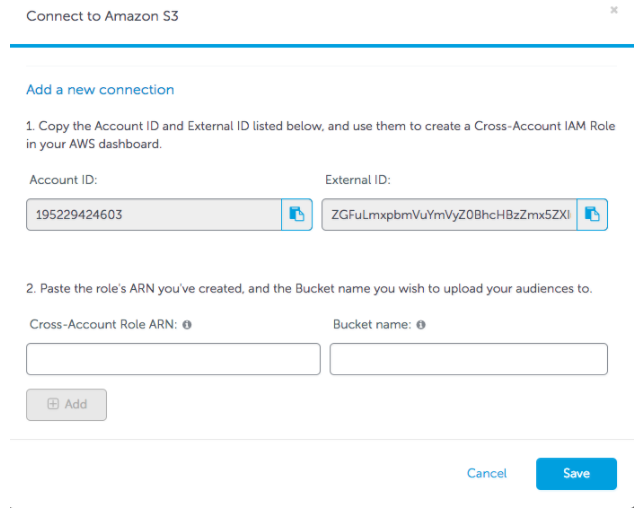 Creating an S3 integration allows AppsFlyer to send the audience Device IDs directly to your S3 bucket. Before going through the integration process, you must first create a Policy dedicated to AppsFlyer’s Audience feature. In your AWS console, go to IAM >> Policies tab. Click Create Policy and then Create your own policy. 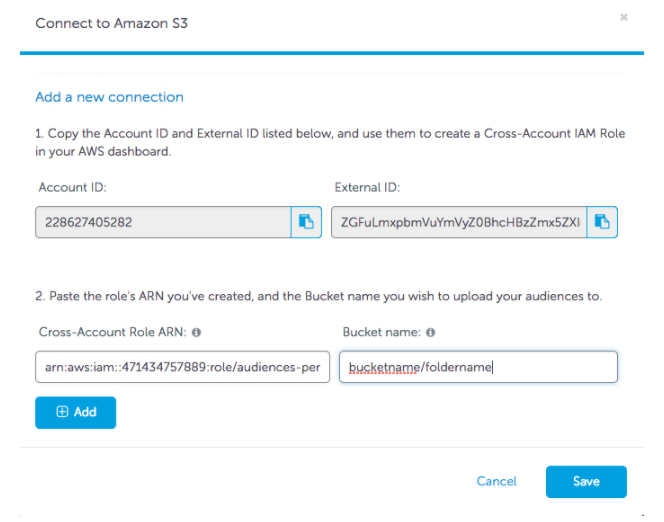 Replace BUCKET-NAME with the name of the bucket to which you want AppsFlyer to upload your audience. The policy must contain only the root bucket and not additional directories in the path. For example, the resource arn:aws:s3:::BUCKET-NAME/Directory/* is not supported. If you need the files to be transferred to a specific directory, see step 14. The actions PutObject, DeleteObject and ListBucket are MANDATORY for AppsFlyer to perform minimal actions on your bucket. 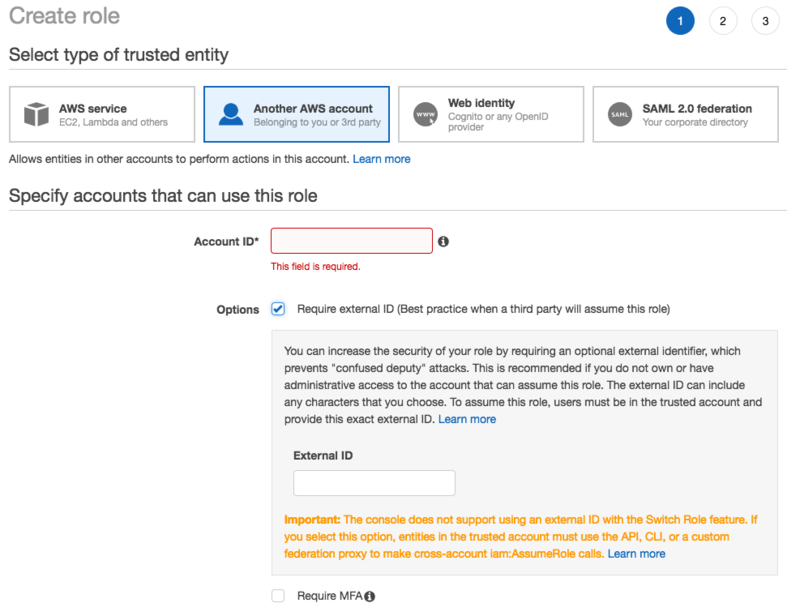 Under Role, for cross-account access, select the option Another AWS account to provide access between your AWS account and a 3rd party AWS account. Copy the AccountID and ExternalID provided in AppsFlyer's S3 integration screen. Paste them into the appropriate input boxes in the role's creation screen. You are prompted to select a policy from the existing policies in your AWS account. Choose the policy previously created. Once the new role is created, click the name of the role to open its properties window. Paste the ARN, with your bucket name, into the appropriate box in the AppsFlyer integration window. If you want to transfer the files into a specific folder within a bucket, provide the bucket name with the subsequent folders inside it, separated by "/" for example (bucketname/foldername/foldername). If you provided a folder name that does not already exist, AppsFlyer creates it during the upload process. Once the integration process is complete and an audience is uploaded, you can see a CSV file with the Device IDs in the bucket specified. Obtain your API Key from your Applift account manager. Enter your DataLift 360 Advertiser email (your login email to DataLift 360’s dashboard) the API Key you've just copied. Click Add Connection to complete the connection. 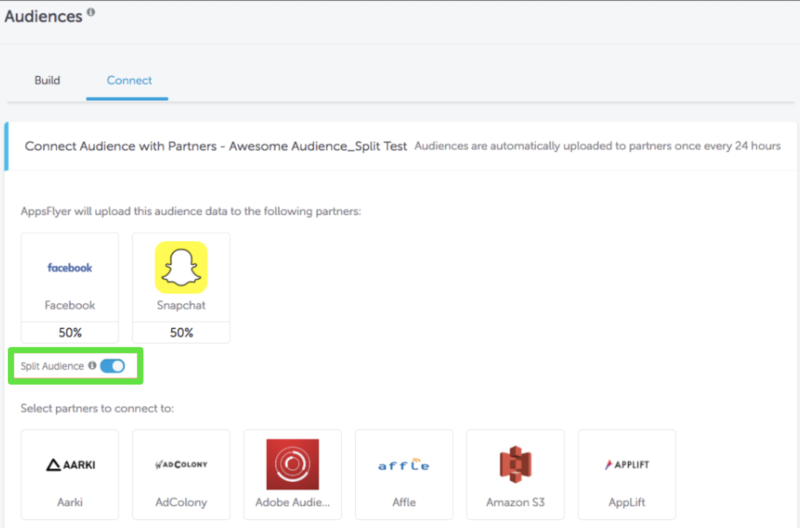 After uploading an Audience to AppLift, you will see it in your DataLift 360’s Audiences dashboard (https://applift.datalift360.com/audiences). Obtain your Custom Audience Key from your Applovin advertiser’s account page. Paste your Custom Audience Key in the input bar. Complete all the necessary fields - email, password, Buzzkey and Account ID. Obtain your app’s API Key from your Beintoo account manager. Obtain your Chartboost User ID and User Signature from your Chartboost account dashboard. Paste your User ID and User Signature in the input bar. Obtain your Criteo Advertiser ID. Copy the API User’s Client ID and Secret, provided to you after its creation. Paste your API User’s Client ID and Client Secret, along with your Advertiser ID in the input bar. Obtain your API Key from your Downstream.ai account manager. Login to your Facebook account and select the required Ad Account. After uploading an Audience to Facebook, it appears in your Facebook’s Custom Audiences dashboard. Obtain your app's API Key from your GetLoyal account manager. Enter your API Key in the input bar. Obtain your app's Property ID from InMobi's dashboard. Paste your Property ID in the input bar. Select the DST LIST Type you want and click Add. Obtain your API Key from IronSource's dashboard. On the top right-hand side, click your account email. From the dropdown menu select My Account. Enter your IronSource User ID (your email address, specified on the top right-hand side of the IronSource dashboard), and the API Key you just copied. Click Add to complete the connection. Obtain your app’s API Key from your Lemmonet Account Manager. Obtain your app’s API Key from your Liftoff Account Manager. Obtain your app's API Key from your Manage Account Manager. 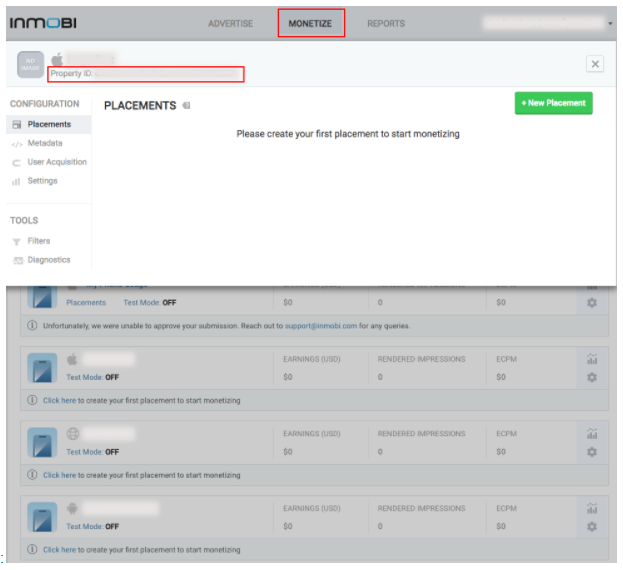 Obtain your app’s API Key from your Mobusi account manager. Obtain your app’s API Key and Advertiser ID from your Mobvista account manager. Paste your API Key and Advertiser ID in the input bar. Login to your MyTarget account, and select your ad account. After uploading an Audience to MyTarget, it appears in your MyTarget’s Users Lists dashboard. 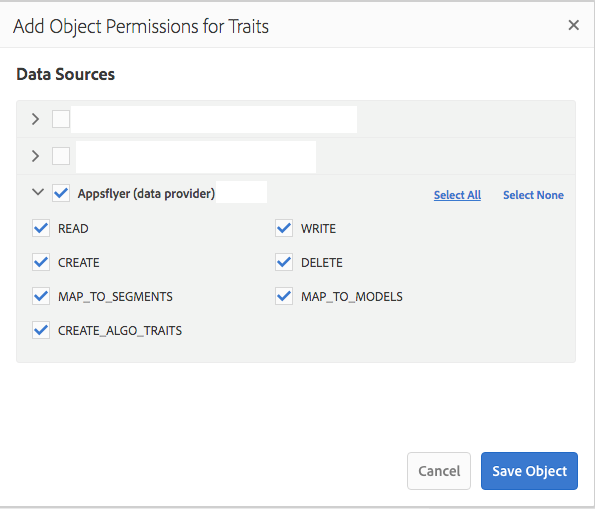 Copy AppsFlyer’s Seat ID, and request your Oracle Data Cloud account manager to whitelist it for you. This enables AppsFlyer to create categories on your behalf. 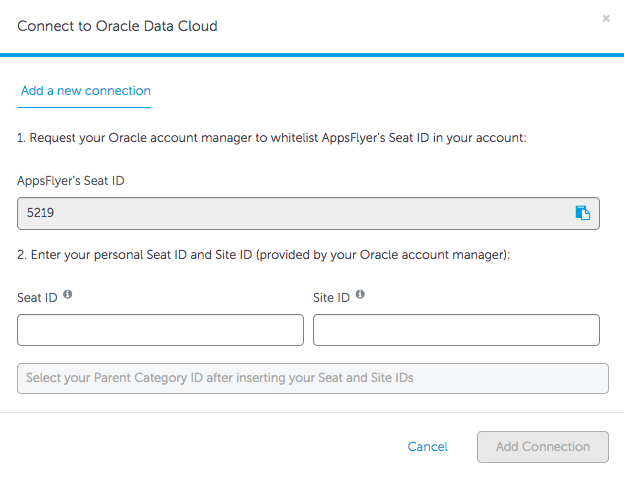 Insert your Seat ID and Site ID (you can receive them from your Oracle Data Cloud account manager). Select the Parent Category under which your sub-categories should be created. Click Login with PushSpring and complete the login process. Once you've logged in, a new timestamp is displayed. After uploading an Audience to PushSpring, it appears in your PushSpring’s Imported Audiences dashboard. Create SFTP access credentials which include Server IP, Username, and Password. If you want the files to be transferred to a specific folder path in the server, enter the path with “/” delimiters (for example, “appsflyer/audiences”). Each file will be added to a folder named after the Audience name itself. The file name will contain the audience name and relevant date (eg. “appsflyer/audiences/MyAudience/MyAudience_2017-10-02”). If you leave this blank, the files will be added to the root folder of your SFTP server. If you want the files to be compressed with GZIP, enable the GZIP files option. AppsFlyer uploads a CSV file of Device IDs to your public Slack channel. Click Add to Slack button. You are redirected to an authentication screen, where you pick your relevant Slack Team. Once the Slack Team is selected, select your public Channel. Once the integration process is complete, and an audience has been uploaded, you can see a CSV file with the Device IDs sent to the selected channel. Login to your Smadex account and authorize AppsFlyer to access your account. Login to your SnapChat account. Select your Organization and Ad Account. 24 hours after uploading an Audience to Snapchat, it can be seen in the dashboard. Snapchat deducts unfamiliar Device IDs, which potentially results in smaller audience size. Obtain your app's API Token from your StartApp account manager. Paste your API Token in the input bar. Obtain your Partner ID from your Tapjoy Account Manager. 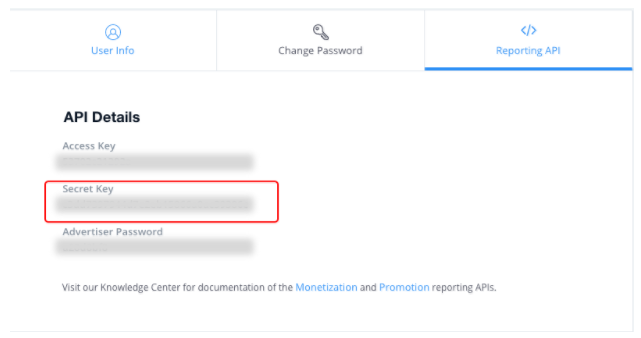 Obtain your Publisher Reporting API Key from your Tapjoy App Settings page. Paste your Tapjoy Partner ID and Publisher Reporting API Key in the input bar. Obtain your app’s API Key from your Taptica Account Manager. Login to your Yahoo account, and select your desired Ad Account. After uploading an Audience to Yahoo Gemini, you can view it in your Oath: Ad Platforms dashboard. Duplicate Audience allows you to make a copy of the selected Audience, with the exact same filters as the original. In addition, you can also choose which partner connections to inherit from the original Audience. The Audience user base updates on a daily basis and so only contains devices data from the previous day and backwards. Set out below are several examples for user segments we can find, estimate and target in just a few seconds, using the Audience builder. Remarketing is an advanced method of advertising to audiences who have already watched or even clicked ads for your apps but have not converted yet. Sometimes for these users to convert you need just some extra convincing or a gentle reminder. Since these users have a high chance of converting, every dollar you spend on remarketing to them can produce significantly better results than advertising to new audiences. You can create very precise audiences for remarketing based on clicks and impressions data collected by AppsFlyer. Consider building an audience of users that clicked on an ad, but didn't install in the last 2 days. These are users that very recently were interested enough in your mobile app to click on your ad, but for some reason didn't install (or installed the app without launching it). Some of these users just need a reminder of your app to install it. Others may need to see more screens or features of your app to finally convert. Therefore, if you have a primary creative you use on new audiences, it is advisable to use a different creative for audiences that clicked but haven't installed yet. At least one positive condition is required to create the base audience, which can be reduced by further negative conditions (eg. installed the app AND did not do af_purchase event). Windows Phone is not supported. Audience names cannot be changed on the connected partners’ side. Nested event values are not supported. When creating an audience, at times, not all the events appear. Only the top 100 are displayed, however, when you begin entering an event name, all the events are shown. The clicks and impressions data only contains devices which have advertising_id / idfa on their original click URL. Therefore devices of users from SRNs, which don't use external tracking links, are not included in the clicks data for audiences. When using the Total Revenue filter within the query builder, the Estimated Audience Size is not available. This does not affect the Audience creation and the Audience list. You cannot combine audiences creates by import with other audiences or rulesets.